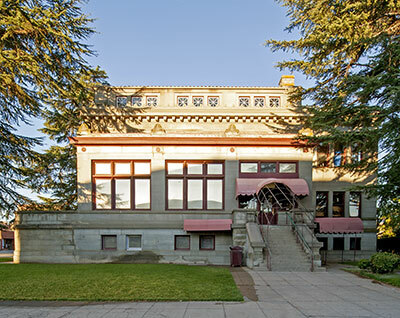 John Q. Packard deeded the land to the City of Marysville and hired William Curlett, architect of San Francisco, to draw the plans for the Classical Revival building. 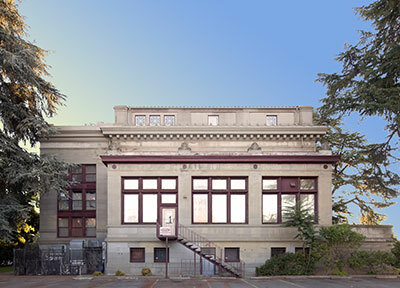 The sandstone, of which the building is made, came from Mr. Packard's own land in Santa Cruz County, sent to San Francisco on his railroad to be cut, then shipped to Marysville. The pedestal lights on the steps facing 4th Street were given by the Ladies Improvement Club in 1908. Adapted from the NRHP Nomination dated 28 February 1978.